Hubby and I recently returned from a six-day vacation in Miami - well, working vacation for him. While he was at conferences, I shopped, sat out by the pool, walked on the beach, worked out in the fitness center, and treat of all treats, I slept in! Hubby and I spent time together, too. We had wonderful dinners, long talks, and shared time by the pool. We could even be intimate without the fear of anyone walking in on us. It's safe to say that after the couple tough years that we have had, we really reconnected and focused on each other. It was a much needed relaxing week. And one in which I didn't take a single dose of my Lexapro. Shortly after my son was diagnosed with terminal cancer, it was strongly suggested to me that I begin taking an antidepressant. At first I resisted. I really didn't think I needed it. Truthfully, I had probably battled some form of depression most of my adolescent and adult life. Nothing really bad had ever happened to me, but still, I was never very happy. I considered seeking the help of a therapist, but didn't want to be "medicated," as I felt there was a stigma to that. Suddenly, I had a reason. Something bad, something horrible, was happening in my life, yet I still resisted medication. At the urging of Hubby and my sister-in-law, who was going through a medical crisis with her own young son, I reluctantly took the pills that another sister-in-law, a nurse, had gotten for me. They did the trick as far as halting the need to run out of the room every hour to try and control my tears. I could go to my son's doctor appointments and treatments and actually deal with what the doctors were telling me. I could be functional around my other sons and be strong for them. I could answer questions about my son's illness with a little strength and grace. It actually worked a little too well. I was taking the recommended ten milligrams per day dose, and some days I felt like a zombie, light headed and just going through the motions. Yes, it was helping me to control my emotions, but I couldn't cry even if I wanted to. In addition to the Lexapro, I was also taking Xanax to help quell anxiety. The months after my son's funeral were, understandably, difficult. In spite of that, I wanted to stop taking the Lexapro. I still felt like a zombie, my mind was in a fog, and I was gaining weight (which, when you're already depressed, is, like, the last thing you need to add). I slowly decreased the amount I was taking until I wasn't taking any. I did notice a difference. Not in my weight, but in the fact that I didn't feel like such a zombie any more. But there was something else. I noticed a difference in the way I was dealing with my children. I was snapping at them more readily, flying off the handle over little things, and generally not having much patience. I was also thinking about my late son a lot...and getting sad...a lot. So I added it back into my regimin, but this time only five milligrams a few times a week (at the okay of my doctor). No zombie feeling, more patience with my kids, and the ability to remember my son with fondness and not paralyzing sadness. Obviously, the ideal treatment for depression is a combined regimin of exercise, eating well, sleeping enough, and talking about your feelings - in short, taking care of yourself. As all busy moms know, often our own needs take a back seat to everyone else's in our lives. It's no excuse, but it does happen. As I prepared to leave Miami, rested, tanned, well fed, and loved up, I opened my prescription bottle and thought, "OMG, do I really need Lexapro to deal with my own children?" When I returned home, the answer was clear. No, I need it to deal with my life! I was greeted by a vomiting three-year-old, a pile of mail, school papers, and forms that needed attention, an empty refrigerator, and several full laundry baskets. I was finding spots of vomit all over the house that were overlooked by the babysitter. I had committed to make soup for the teachers' dinner on conference night (that night!) which had to be delivered at a set time, but not a set place, so I was running from place to place in the school with a heavy - and hot - crock pot in my hands followed reluctantly by three little boys, one of whom was sick and whiny and cried the whole fifteen minutes of my seven-year-old's subsequent parent-teacher conference. To top it off, Hubby had a work meeting that kept him until long after the boys were bathed and in bed. And that was just my first day home! I collapsed that night. My second day greeted me after a well rested night. The babysitter was over, and I got in some prenatal yoga and pilates with a trainer at my gym and time to run errands child- and stress- free. I actually sat down to a healthy lunch (that almost never happens! ), and felt great the rest of the day. All without that little five milligrams of Lexapro. Obviously, Day Two was a much better scenario for my mental health. However, with child #5 on the way, still desperately missing child #1, concerns over my and the baby's health, issues with my other sons, lack of time with Hubby, and so on and so on, I don't know when life is going to get less hectic. I don't know when eating well and sleeping enough and getting exercise and regular intimacy (or even just a simple conversation with Hubby!) are going to become status quo again in my life. I envy women who can balance it all - make taking care of themselves, instead of worrying about the laundry and the vomit a priority. Until such a day comes for me, I will continue with the Lexapro because it's just how I deal with everything that life is throwing at me right now. And when I can "deal," I seem to be a much better mom, wife, and friend. 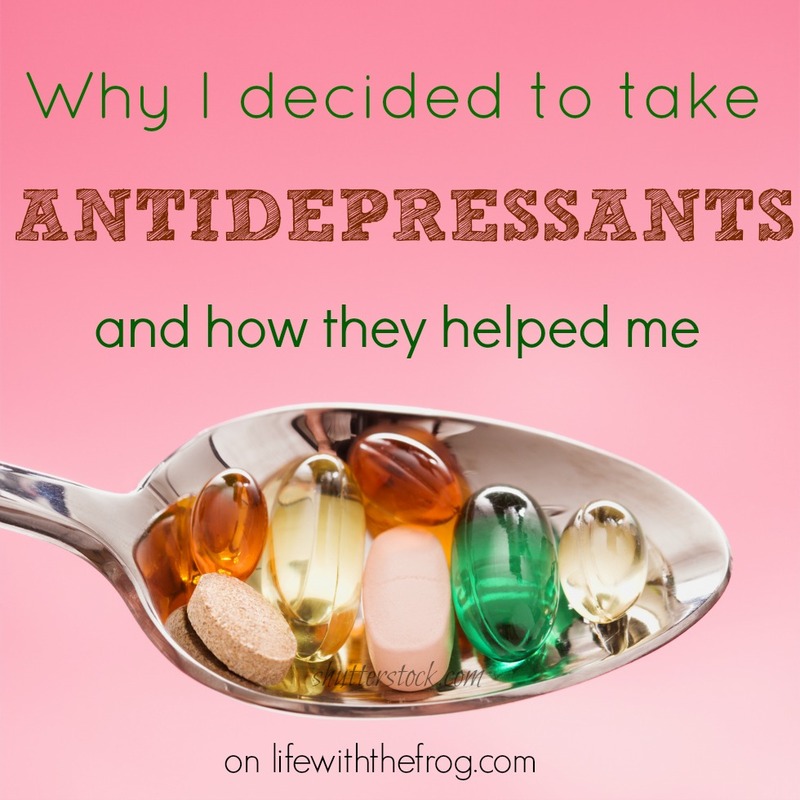 Read here about why I decided to continue taking antidepressants during pregnancy.